Q: What do you call a monkey that sells potato chips? Q: What&apos;s black and dangerous and lives in a tree? A: They tell jokes about people! Q: What do you call a baby monkey? Q: What do you tell a bad monkey? Q: What do you call a monkey with a banana in each ear? A: Anything you want, it can&apos;t hear you! Q: What did the monkey say when he cut off his tail? A: It won&apos;t be long now. Q: Where do monkeys go to drink? Q: What do you call an angry monkey? Q: Did you hear about the man who can jump from tree to tree? A: He was a monkey&apos;s uncle. Q: What do you call a Chimpanzee that works in a bar? Q: What do you call a monkey with a wizards hat and wand? Q: What does a logger say before he cuts down a tree? A: Let the chimps fall where they may. Q: Did you hear about the awful jungle party? A: Somebody forgot to bring the chimps and dip. Q: Where should a monkey go when he loses his tail? 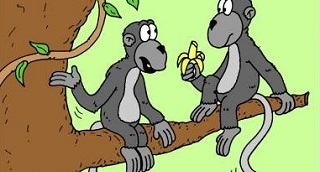 Q: What did the banana do when he saw a monkey? Q: Why don&apos;t monkeys play cards in the jungle? A: There are too many cheetahs there! Q: Why shouldn&apos;t you get into a fight with a monkey? A: They use gorilla warfare. Q: Where do chimps get their gossip? A: On the ape vine! Q: How do you get an escaped lion back into his habitat? A: With a bargaining chimp. Q: What do you call a restaurant that throws food in your face? Q: How do you catch a monkey? A: Climb a tree and act like a banana! Q: What did the monkey say. When he slide down the flag pole? A: Goodness gracious great balls of fire. A: Nothing, bananas can&apos;t talk! "Uhhh," Nico groaned from the floor. "Not monkeys," Hazel grumbled. "I think those are dwarfs."